there will be thousands like us. and waiting pastures of America. I am refugee. You are too. Cry, but do not weep. 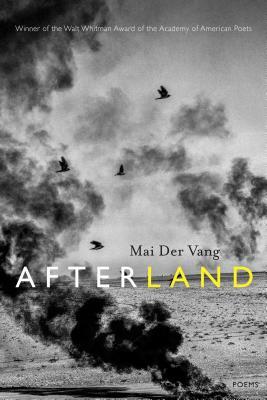 Afterland is a powerful, essential collection of poetry that recounts with devastating detail the Hmong exodus from Laos and the fate of thousands of refugees seeking asylum. Mai Der Vang is telling the story of her own family, and by doing so, she also provides an essential history of the Hmong culture’s ongoing resilience in exile. Many of these poems are written in the voices of those fleeing unbearable violence after U.S. forces recruited Hmong fighters in Laos in the Secret War against communism, only to abandon them after that war went awry. That history is little known or understood, but the three hundred thousand Hmong now living in the United States are living proof of its aftermath. With poems of extraordinary force and grace, Afterland holds an original place in American poetry and lands with a sense of humanity saved, of outrage, of a deep tradition broken by war and ocean but still intact, remembered, and lived. Mai Der Vang is an editorial member of the Hmong American Writers’ Circle and coeditor of How Do I Begin: A Hmong American Literary Anthology. Her essays have appeared in The New York Times, San Francisco Chronicle, and The Washington Post.